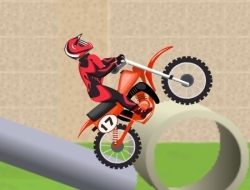 This is a fun motorcycle game in which you will have to make your way to the end of the tracks. Enter this Enduro competition and keep in mind that the goal is not to gain lots of speed but to get past the obstacles in as little time as possible. Make sure you wont crash as you will have to start over if you do that. The way you lean the bike is crucial as you need to constantly keep it in balance so you wont flip over. Also you need to be careful with the throttle as it can easily spin the bike over. Try to reach the end as fast as you can because as the time goes by the score you will receive will get lower. Complete all the courses and see if you can become the next enduro motorbike competition winner. Use the arrow keys to drive and lean on the bike. Enduro 0.00 between 0 and 10 based on 0 votes.